Experience Niagara Falls at night on this evening tour from Toronto. This tour includes complimentary pickup from all Toronto and airport area hotels by a professional driver who will guide you fully around Niagara Falls and Niagara-on-the-Lake. Take a Hornblower cruise, enjoy a wine tasting, have dinner overlooking the falls and watch a spectacular fireworks display! Get free door-to-door pickup from all downtown Toronto hotels and airport area hotels. Once in Niagara Falls, enjoy a ride on the Hornblower cruise. You’re in for the thrill of a lifetime on this ride! Visit the world’s smallest chapel, a site you won't see on many other tours. You'll have an excellent photo opportunity here. Stop at Queenston Heights, an extensive hillside area on the Niagara escarpment, centered on a heavily wooded, landscaped park. The park marks the site of the Battle of Queenston Heights in the War of 1812 and contains Sir Isaac Brock’s grave. You'll also visit the Floral Clock, a unique attraction that's a very popular stop on the Niagara Parkway. Sit down to a buffet dinner at the Sheraton Fallsview Restaurant in the Sheraton Hotel Penthouse Level at The Falls. You will enjoy a tasty meal with many dishes to choose from while enjoying the spectacular view of the Canadian Horseshoe Falls and American Falls. This is an awesome photo opportunity! You'll have free time to explore at your own pace for more than 4 hours. Every evening beginning at dusk, the falls are lit with the colors of the rainbow. Don’t miss the unmatched beauty of Niagara Falls at night! 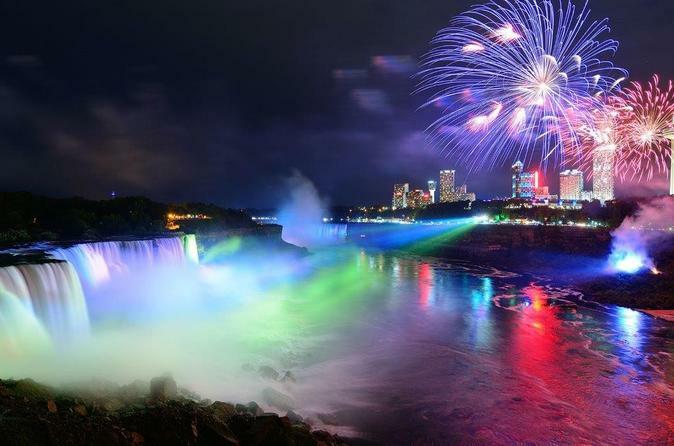 Enjoy the fireworks over the Canadian Falls. Return to Toronto at the end of the night.